I recently read this book called Getting Things Done. I picked it up because it was apparently quite popular. Whenever something is quite popular the best advice is to avoid it entirely. I got sucked in this time, I guess. Business books and efficiency books bore me entirely most of the time. I used to like them. Not any more. Usually they are written by business failures who can write. Books about submarine missions or biographies are far more interesting. Back to the point: Getting Things Done is a personal organizational technique. Hmm, technique is too small of a word. Better is system or plan for keeping things in your life organized. So my current conclusion is that the book says a lot of important things and rather than just suggesting you should get more organized it actually has things you can do and if you do them it helps keep things organized. The trouble is you have to keep it up and simply starting takes a lot of time. The author says most people need 2 or 3 days just to get everything out of your head and into organized to do systems. That sounds scary but you can begin to implement some of the things the author writes about immediately. Simple little processes that combined are supposed to really help keep you organized. So I have finished the book. I need to re-read it because I feel like I missed something. It hasn’t transformed my life like everybody says. Something though that I have discovered is that even if I haven’t implemented every technique discussed in the book it inspired me to rethink everything about the way I organize projects. Causing me to look for solutions. One thing I’ve done is create project jackets for every single project I have going. “I would agree with you entirely” is what I would have said two weeks ago. 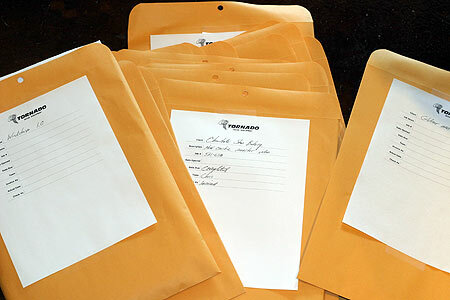 Chris’ Rule: If you have a lot of papers sitting around, think about what categories that stuff might fit into and create envelope jackets for that stuff so you can get it out of sight and out of mind (except when you need it). Having a new project jacket is wonderful. Now I can carry project stuff with me everywhere and I look organized (clients like that for some reason) and I also feel more organized. I can also just grab a folder and know I have everything related to that project. It makes it easy to look up old notes and papers. I’ve seen people use project jackets before. Other agencies use them and so do the folks at Kinko’s. I never imagined that I would like them as well. My project jackets are simply 12″ x 15.5″ catalog envelopes I picked up at OfficeMax and I created a “jacket” template I print and write on. I write the project name, client name, the date the project was opened, finished, and is due. Other information I might add: invoice and check numbers and team members. I also create a project number. Each project follows a consecutive number. A project is anything that involves more than a few hours or if you will be doing it on a separate day. The project numbers are handy because at the end of the year you can see how many projects you did. At the very least, you can tell your friends you did X number of projects and they’ll be impressed you even know. “Wow Chris, that’s really impressive!” they’ll say. Then I might say: “This concludes our project jacket seminar. Insert big groan from the audience here. Actually, I’ve been using project jackets for a few years now. The only difference in mine is that I took my specs form and my 9 x 12 envelopes to Kinkos and had the envelopes printed with the blank form. That way, I don’t have to be so careful in my filing of them. Even have project numbers (I believe you posted on that subject not long ago) for the folders. My project numbers are based off the dewey decimal system and SIC codes. Probably a bit complicated for web design alone, but I do a lot of multimedia development, so it helps when dealing with multiple disciplines. Wow, Chris. That’s really impressive. how do you store all of the collateral for each project, we get masses of binders, folders, brochures and cd’s sent to us, a simple jacket doesnt carry enough storage – we use these big blue folders. Good comments everyone. The envelopes I’m using are a bit bigger, so sometimes if I have a whole lot of stuff I create a second folder with just project stuff. If you keep your projects separate usually you won’t get tons of stuff. But on several cases I’ve had to make more than one folder. I’d recommend that if you constantly need more room that you find a way to use bins, or bigger envelopes, or something to organize the stuff. Good question. I’ve found burlap potato sacks to be large enough to handle most project-related items. Of course, they don’t file easily, but you can hang them in your closet like shirts. Closets are just like big filing cabinets! Yay! That was a good one Ben. i think you can get caught up in trying to follow GTD in an absolute way. i love this book but don;t forget to be flexible and adapt it to your working style. Ward: Yeah, that’s actually one of the things I was thinking about. That is one reason I’ve only implemented project jackets. And honestly, it was more out of reaction to seeing someone else have success with the project jacket idea. right..you know it’s funny, there’s even a new firefox extension for the GTD crowd where it guilts you if you are browsing too long..because, the assumption is if you are browsing too long you are not ‘getting things done’ – i just think there’s a point where it’s on you not on the system to take care of things. Haha, that is funny. If you want my advice: A fast computer is sometimes all that is needed to get things done. I got a new hard drive after my other one had apparently slowed to a crawl and I’m getting WAY more done this week than before. Weird.